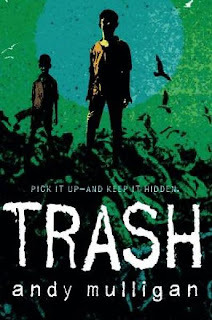 Raphael and Gardo are “dumpsite boys,” literally digging through what is buried in their Third World city dump every day, looking for anything that could be turned into a profit. Usually this is just things that could be sold for recycling. One day, Raphael’s digging unearths an expected treasure—a wallet, money, a map, and a key. When the police arrive, asking questions about an important bag that was mistakenly discarded, the boys know that there’s a great deal more to the story. Murder, a missing $6 million, corruption, treasure hunting, and adventure that takes them all over the city and beyond keeps this story moving. Raphael, Gardo, and their friend Rat take turns telling the story, with cameos from adults that help them along the way. Trash is a compelling read, with excitement and situations similar to the movie Slumdog Millionaire (2008), but appropriate for students. Mulligan, Andy. Trash. David Fickling Books, New York. 2010.